Mathew, Kristen and Willow came out on a great day for a session, slightly chilly but still pretty nice. Willow is such a sweet and beautiful little girl whom I had previously worked with in the summer. She just grins from ear to ear and seems so happy all of the time! I truly enjoyed working with this family and hope they enjoyed their session as much as I did. Jamie, Bethany, Sophie & Sawyer were so sweet at their session! It was pretty chilly outside but still nice for being so late in the year. We ran through their session pretty quickly so the kids didn't get too cold and their session turned out great! This session was taken at my favorite exclusive location right here in Wilmington. There were a few dog distractions, but we made it through! 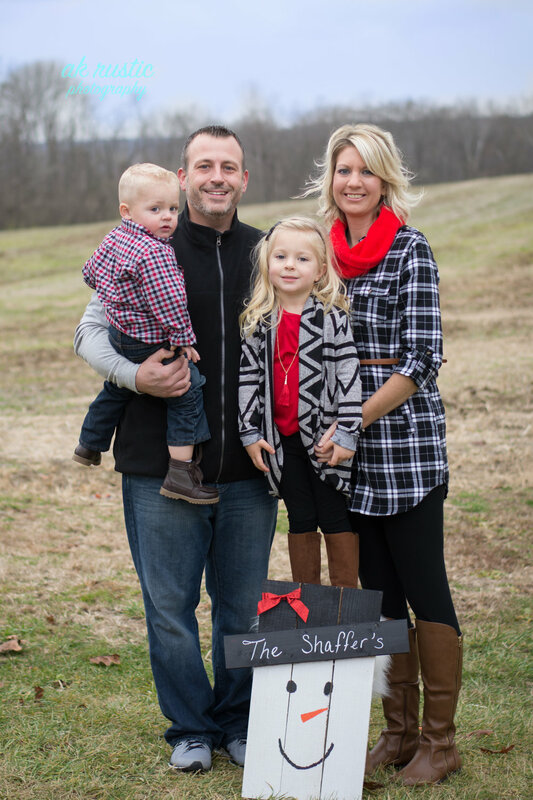 Thanks for a great session Jamie and Bethany; you have a very beautiful family! As a photographer, I give you all tips and tricks on how to prepare for your own family sessions. Now it’s my turn to prepare for myself and I want to take you through how I get ready and take my own advice! First of all, let me just say that I decided last night that I was going to get our family photos done TONIGHT! I broke the news at the dinner table as everyone was getting their bellies filled and the day was coming to a close. That way I didn’t hear, “I don’t want to” or “do we have to” by my kids (and husband). Granted, I take their photos WAY more often than the normal person and I don’t just mean with my phone. I doll them all up and fix their hair and have them cheese it up. So I understand why they aren’t up to getting them done “again”. Now it’s the morning of and I need to get our outfits together. Usually I tell you all to get your outfits together way more in advance than the morning of but I’m a last minute kind of girl. I’m going to first start with my own outfit because if momma doesn’t like the way she looks then those photos are not going up on the wall and I need… okay, I want a giant metal print above my couch that will fill the space of 5 - 16”X20” prints and frames. The good part… I know what I want these photos for and I know what orientation it needs to be which is very important for a photographer to know. Now that I have my outfit picked out, I’ll go pick one for my 2 girls (ages 7 and 8) then my son (age 5). They usually have cuter clothes in abundance so it shouldn’t be too hard to choose. I also give my husband and son a hair cut before I get ready. I’m not spending all this time getting stuff ready for them to look scruffy. Next, I’ll make sure that everything is on a hanger and ironed if needed. Also, I will keep my husbands nice shirt on a hanger until we are out of the car on location. Their shirts wrinkle so easily and that is not easy to photoshop out (contrary to popular belief). That way when the kids get home from school I will not be rushing around and making this an unpleasant experience for the kids before we even start. I want this to be a good experience for them because I don’t want them crying right before we take the photos. Now to get ready for myself. I always get ready first, because I take the longest and I don’t want the kids getting their outfits dirty or hair messed up long before needed. I’ll exfoliate my skin to give that smooth and glowing look prior to applying my makeup. Speaking of makeup, I do put on more concealer, foundation, blush and bronzer than normal so I don’t look dead in the photos (yep, I said it!). I also don’t wear a lot of eye makeup, I will add more mascara to my top lashes but if I put too much eyeliner and eye shadow on then my eyes will look black instead of “intense” like I want. Another option is to higher a makeup artist (which AK Rustic Photography offers). Because we are going outdoors into the grass, I know that I cannot wear heals that cannot be cleaned well or that will sink into the ground. I don’t want to worry about that on top of everything else (kids faces clean and such). I also know that if the kids start to complain about their shoes, then we are going bare footed! So I had to plan my husbands outfit to look good without shoes (aka, no dress pants). Now, let’s be honest. Most kids like having their photos done at first and then they slowly start to fade away. If you have a great family photographer then they can keep the kids attention around for a little longer than normal. Because this session is with my kids who get this done a couple times a month (yes, I said it right!) their attention span is out before we even begin. So how will I get them to smile? They’ll each earn a dollar if they do what makes mommy happy. Let me know if the comments below what’s your biggest tip for getting ready for family photos. Also be sure to check out my fb page on tips and tricks for your next family session here. Our Christmas Limited Edition Sessions are right around the corner so I made a special fb group just for tips and tricks to get ready here. Once you request to join, I'll add you within a couple of hours.